Don’t @ me, TBR, for judging the judgment of the Mom in this story. When you have a kid who is planned, you are in essence making a commitment to do your best for them. It’s different by class and access to wealth and education, definitively, but the mother in this book is a single parent by choice. While it was undisclosed, I believe that she had some untreated mental illness. I was enraged with the adults in this kid’s life who didn’t intervene – all of the mother’s friends who know she’s flaky, the dad blithely allowing her free reign to raise his son… Though Felix never seems to think this – he’s twelve, nearly thirteen, but he’s a young, trusting twelve. The cynical twelve I was would have driven this woman crazy. At any rate, this is a story of survival, serving as both a window and a mirror for kids who live basically a half step away from homelessness. First published in Canada, the Canadian cover has strict lines of blue and black houses on a greenish background, and then one bright yellow van, stranded in the middle in a “one of these things is not like the other” moment. The American cover is actually kind of …festive – there’s laundry on a line strung across the front of the van, there’s a kid on top of the van with a penumbra of blond curls and a pet rodent, and in the front window of the van, there’s a little Swedish tomte, or gnome. The homelessness looks almost… like camping. An inviting, cozy way to live. With America’s intolerance of the homeless, there’s some rich irony for you. 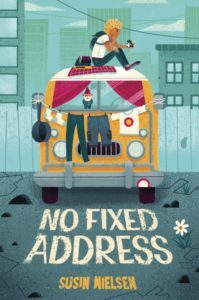 Felix and his mother, Astrid, a woman of flexible morals and appalling judgment, through a series of bad judgment and bad breaks end up living a van for a while – just for a while, mind. As an adventure. Because they live within the right catchment area (and because Astrid does a bit of blackmail on the side) Felix is going to a school he’s always wanted to attend, has reunited with his very best friend, and is able to participate in writing French feature stories for the school paper. Life, in some ways, is wonderful. And, in some very real and terrible ways, it is truly awful. I loved the realism in the novel. At one point, Felix, who has to use a public toilet, due to the van not having a bathroom, is ill. He’s unable to make it to the bathroom. He’s thirteen, and unable to bathe regularly, and his friend tells him bluntly that he stinks. The small and regular things which housed people take for granted – a house warm enough in the winter, the option of extra blankets or a humidifier when ill – slowly slip away from him, and he becomes increasingly frantic to have some semblance of normalcy. And his anxiety just spikes. All of this was horribly relatable. One major thing which did bother me was the casual racism in the depiction of Winne Wu. She is a walking stereotype of the overly brilliant Asian character whose emotional I.Q. is minimal and who cannot read social cues of any sort. Additionally, she’s stereotypically bossy. Felix eventually realizes he’s crushing on Winne, but… why? If she’s so annoying? The reader isn’t given clues, except she’s female, so it was apparently going to happen – ? The romance feels a bit like it was ordered and subsequently provided, but I was unconvinced. Despite my difficulties with Astrid and Winnie, I think a lot of readers will find this enjoyable and will bring on a few tears and moments of tender-hearted reflection. Kids’ hearts are so moved by homelessness anyway that thinking about it happening to someone their age will be for many, a call to action.